ABBOTT MOTORS, An exceptional car buying Experience, is offering this exceptional vehicle for sale. ABBOTT MOTORS has over 50 years of automotive experience! We are also a CARFAX Advantage Dealer. We offer great deals and specialize in FINANCING FOR EVERYONE-ALL CREDIT APPS ACCEPTED! We look forward to helping you purchase your next vehicle. CALL or TEXT (716) 229-5711 for quick answers to your questions about this vehicle. Your message will be answered by a real human never an automated system Drive home in your new pre-owned vehicle with the knowledge you're fully backed by the CARFAX Buyback Guarantee. 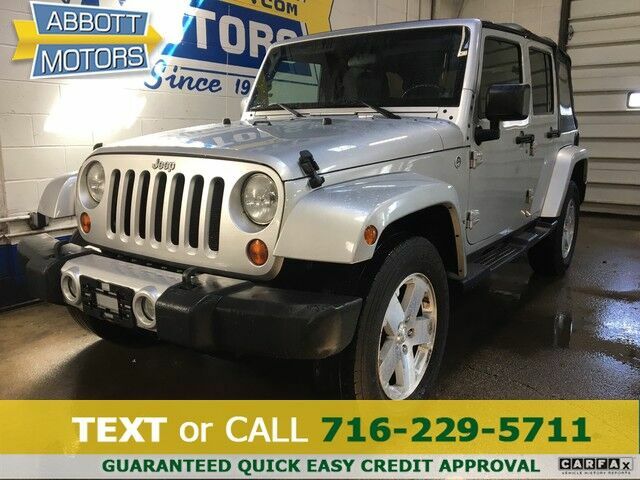 This is a well kept ONE-OWNER Jeep Wrangler Unlimited Sahara 4WD with a full CARFAX history report. The Wrangler Unlimited Sahara 4WD doesn't disappoint, and comes with all the quality and understated opulence buyers have come to expect from the respected Jeep marque. A truly versatile SUV, this vehicle will please even the most discerning of buyers. Equipped with 4WD, this Jeep Wrangler gives you added confidence to tackle the surface of any path you take. Low, low mileage coupled with an exacting maintenance program make this vehicle a rare find. The interior of this Jeep Wrangler Unlimited Sahara 4WD has been through meticulous inspection and could almost pass for a brand new vehicle. The 2008 Jeep Wrangler is built with pure muscle. Punch the throttle and feel the power of its torque and horsepower plant you firmly to the back of the seat. This 2008 Jeep Wrangler Unlimited Sahara 4WD is not like every other automobile. The Jeep was equipped with many of the added features that make this vehicle such a unique automobile to own and drive. This Jeep Wrangler is equipped with navigation, so you no longer have to wonder if you're headed in the right direction. The tires on this vehicle have passed a rigorous inspection for safety, stability and tread life. There is no evidence of prior damage or paintwork on this Jeep Wrangler Unlimited Sahara 4WD. The standard wheels have been upgraded to gives this vehicle a whole new style. More information about the 2008 Jeep Wrangler: The 2008 Wrangler furthers Jeep's long-established reputation for exceptional off-road ability, and also features a surprising array of modern conveniences, along with very good interior comfort and safety features. The Wrangler may be worth its price for its unique looks and capabilities alone, which explains why it continues to occupy a place at the top of the list of best-selling SUVs on the market. Strengths of this model include Rugged looks, excellent lifetime limited powertrain warranty., go-anywhere off-road ability, and wide range of configurations STOP IN TODAY or Apply Online 24/7 at Abbottmotors.com ... All Trade-ins Welcome... Same Day Delivery... Call or Text Today and See The Difference... We Look Forward to Serving You! !This vehicle may be subject to potential open recall(s). Vehicle recall information may be found at Safecar.gov. Please verify price, equipment, options and features with your sales rep before your purchase. We Look Forward to Serving You. *Tax, title, plates extra. All Financing On Approved Credit. BBB accredited A+ member.